194 pages | 20 B/W Illus. 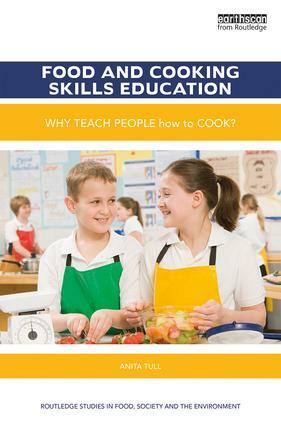 Food and Cooking Skills Education (FCSE) is a complex mix of policy and practicality, educational theory and pedagogy, classroom and government policy. This book shows how FCSE has been at the centre of a tussle between education and policy for decades. It reviews how FCSE has grappled with various significant issues of concern that threaten to marginalise it and pose problems for educational practicalities, as expectations are increased, but resources are squeezed. It assesses the debate about the significance and importance of acquiring practical food and cooking skills in a society where the purchase of ready-made food has become commonplace, and public knowledge of where our food comes from is noticeably lacking. This has contributed to the escalating incidence of diet-related diseases and the attendant cost to society, and threatened environmental sustainability. In turn, governments have reacted by proposals to make practical cooking skills a statutory National Curriculum subject as part of the armoury for tackling such costs. Based on detailed research conducted across England and Wales, as well as comparisons with thirty-five other countries or states, the author makes recommendations for policy to manage this challenge facing contemporary society. Anita Tull is a freelance Food and Nutrition Educational author and consultant, based in the UK. She has written several school textbooks on home economics, food and nutrition. She has worked in food and cooking skills education for forty years and has taught primary and secondary pupils and adults in a range of schools, colleges and community initiatives. She has a PhD from the Centre for Food Policy at City, University of London, UK, on which the work covered in this book is based. This series includes a wide range of inter-disciplinary approaches to food, society and the environment. It includes textbooks, research monographs and titles aimed at professionals, NGOs and policy-makers. Authors or editors of potential new titles should contact Hannah Ferguson, Editor (Hannah.Ferguson@tandf.co.uk).